The billboards by Sen. Eric Adams are "to tell our young people and our community ... we are better than this." In Virginia, a high school campaign proclaims, "Your swag is as low as your sag"
New York (CNN) -- A Brooklyn, New York, politician is hitting the streets in an effort to bag the sag. 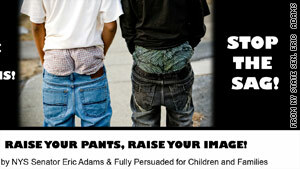 State Sen. Eric Adams announced plans to post six billboards around Brooklyn targeting the pants-sagging trend popular with many young men. The billboards, which will hang on busy streets, feature two young men wearing low-hanging pants above the phrase, "Raise your pants, raise your image." "It's part of a larger campaign ... to tell our young people and our community as a whole, we are better than this," Adams told CNN, adding that the sagging trend originated from prison culture. According to the former New York police captain, "I policed all over the city. ... The first indicator of whether a young person was in trouble was the way they dressed." He plans to reach out to school boards to establish a standard dress code in classrooms and is also looking to media outlets, the Internet and endorsements to spread the word. Adams' effort is not the first campaign against sagging pants. In Hampton, Virginia, a high school just launched a campaign proclaiming, "Your swag is as low as your sag." Kecoughtan High School Class President Rasheed Parker, 17, started the movement after witnessing the growing trend at his high school. "With the job market now, you've got to be really competitive," Parker told CNN. "If there's one guy looking nice and one guy sagging his pants, they're going to hire the guy looking nice." Riviera Beach, Florida, and Flint, Michigan, passed bans against sagging pants in recent years, but the Riviera Beach legislation later was declared unconstitutional after a court challenge. New York's Adams isn't looking to sign a law against below-the-belt wear, but he hopes to get a conversation started. Kecoughtan High School Principal Rashard J. Wright in Virginia is on the same page. "It's cross-cultural, it's cross-generational and it affects all students alike ... we have taken an approach of creating dialogue to stimulate conversation and awareness around some of the negative connotations of sagging," he told CNN. While recent campaigns across the country are causing a stir, some students aren't sold. Minnesota high school student Casey Peterson, 17, said, "I think schools should let kids wear what they want. They should have a right to express themselves."